(2dc, ch1, 2dc) in same stitch or space. vst. (1dc, ch1, 1dc) in same stitch or space. Back is left open from yoke downwards for easy access. Rpt Row 2 until nine rows have been worked in all, you should have 112hdc at the end of Row 9. Pattern Row 1 - ch4, skip 2dc, 1sc in ch1 space of shell group, * ch1, skip 2dc, vst in next sc, (see abbrev) ch1, skip 2dc, 1sc in ch1 space of shell group * rpt from * to * to last 2dc and sc, ch1, skip 2dc, 1dc in last sc. Turn. Pattern Row 2 - ch1, 1sc in base of ch1, * skip ch1 space, shell in next sc, skip ch1 space, 1sc in next ch1 space on vst, * rpt from * to * to last sc and ch4 to turn, shell in sc, 1sc in 3rd of ch4. Turn. Rpt Pattern Rows 1 & 2 until 10 shell group rows have been worked in all, your work should measure approx 10.5 Inches from shoulder. Fasten off. Turn. With WS facing and color 1, ch1, 1sc in base of ch1, * 1sc in each of next 2dc, (1sc, ch2, 1sc) in next ch1 space, 1sc in next 2dc, sl st in sc, * rpt from * to * to end working 3sc in last sc not a sl st, work 39sc evenly in row ends up first back edge, 3sc in corner, working along cast on edge work 1sc in each of the starting ch around neck, 3sc in corner, work 39sc evenly in row ends down second back edge, work 1sc in base of ch1, sl st to first sc on beginning of row. Turn. Buttonhole Row - ch1, 1sc in base of ch1, 1sc in each of next 28sc, * ch2, skip 1sc, 1sc in each of next 5sc, * rpt from * to * once, ch2, skip 1sc, 3sc in next sc, 1sc in each sc around neck, 3sc in corner, 1sc in each sc down second back edge. Turn. Next Row - ch1, 1sc in base of ch1, 1sc in each sc to neck edge, work (1sc, 1sl st) in corner, sl st in each sc around neck edge to next corner, work (1sl st, 1sc) in corner, 1sc in each sc and ch2 space down back edge to end. Fasten off. Next Row - ch1, 1sc in base of ch1, * (1sc, ch2, 1sc) in next hdc, skip 1hdc, * rpt from * to * to end, sl st to first sc on beginning of row. Turn. (12, ch2 spaces) Fasten off. Finishing - Close small gaps under arms, weave in any loose ends of yarn and trim off, attach small buttons to correspond with buttonholes. (Optional) decorate with an animal motif. 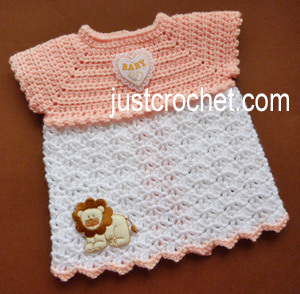 Hope you enjoy this free baby crochet pattern for an open back dress.